viaLibri ~ THE GOSPEL ADVOCATE, Conducted by a Society of Gentlemen. Volume V and VI for the Years 1825 and 1826. THE GOSPEL ADVOCATE, Conducted by a Society of Gentlemen. 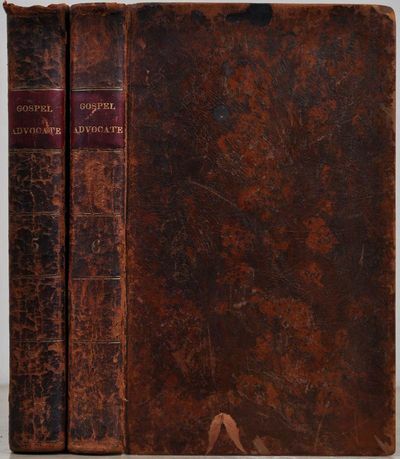 Volume V and VI for the Years 1825 and 1826. Boston: True and Greene, 1825. Book. Very good condition. Hardcover. First Edition. Octavo (8vo). 1825: [viii], 400 pages of text including an index. Two bound volumes of this monthly publication containing issue Nos.49-59 and 61-72, otherwise known as Vol. V Nos. 1-12 and Vol VI, Nos. 1-12. 1826: [viii], 490 pages (actually 390 pages) of text followed by [ii] pages of index. One page with a clean tear. There is an error in pagination; page 298 leads to page 399, making the page count of this work about 100 pages less. Both matching original full leather bindings have moderate shelfwear and some scuffing, remaining intact and attractive. Previous owner's bookplate on the inside front covers (E.D. Campbell Ann Arbor, Michigan), and handwritten name on the title page: H.M. Campbell. Henry M. Campbell was an early settler of Detroit, arriving there in 1826. Heavy foxing to the endpapers, and minor foxing scattered lightly throughout the text. Complete with a table of contents and index, this work offers much in the way of business affairs, concerns and pursuits of the Church, as well as sermons. Articles include those on Peschier's defense of Indian Missions, on Cherokees, Choctaws, and missions in the Sandwich Islands, Malta, Syria, Palestine, Buenos Ayres, Chile, Peru, Colombia, Burmah, Bishop Chase's visit to the Oneida and Mohawk Indians in Ohio, on Chinese worship, Bishop Hobart's visit and Address to the Oneida Indians, etc., etc. First edition..